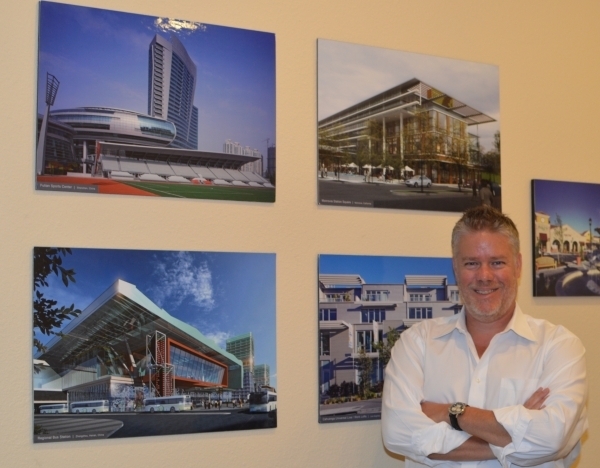 He’s a registered architect with more than 20 years of experience, including significant time in Las Vegas. An artist and sculptor at heart, he studied in Italy. And his architecture spans the globe. Now Nadel, an international design firm, has retained him as director of its hospitality studio in Las Vegas. Simmons explained his career has been “following the trends and the booms.” His return to Las Vegas is an indicator of the area’s economic recovery. “You don’t know how good Vegas is until you leave it,” he said. His career started with John Portman & Associates in Georgia before he came to Las Vegas the first time to work for Paul Steelman at Steelman Partners. Simmons gives Steelman the credit for much of what Las Vegas has become, saying “I think Paul saw the trend of incorporating modern hospitality into the gaming industry” back in 2004. Simmons was lured away from Las Vegas during the recession when he joined Getch Partners Inc. in Chicago. Simmons worked on expanding the firm’s hospitality division in the Asian and Middle East markets. The Georgia Tech graduate’s resume includes work on the SLS and the Arena Plaza. His international accomplishments include the Wyndham Grand in Riyadh, Saudi Arabia, along with the Park Hyatt Beijing Hotel, and the Westin Warsaw Hotel in Poland. Q. What is your plan moving forward at Nadel? A. The goal here is to expand. Nadel has a history of some hospitality work dating back to the Aladdin project where we’re just the architects of record. But also other hotels and hospitality work within the region and also internationally. I think the goal is to maximize on that, build it, more forward, more progressive, expanding the portfolio. Also taking advantage of some of the work here in Las Vegas. We go onto something hospitality-driven but also some gaming influence. Q. Which of all your Vegas landmark projects most represents you personally; your design; your influence? The Park was a real nice example of work. A lot of stuff in Vegas, obviously, entitlements and big designs, never get built. I had a lot of fun with that. But that’s more just experimental side of architecture in Las Vegas. Redevelopment work, did some of that as well. That’s more of a guest experience on a smaller scale. I think the MGM Park was a great project because that incorporated the architecture side. We have large blocks of retail, food, and beverage in there; but also the coordination side with the landscape and the designers coming together with a real nice symbiotic project. Where the pieces related, the architecture matched the landscape, great positioning, sculpture elements were expressed, materials were carried through; so, I think the Park, for Vegas, I think is unique to Vegas. Q. What about your unique resume helped you to be chosen by Nadel? A. I think it was probably the scale and the experience. Being a young architect. Getting a lot of experience at Portman, getting a lot of hotel work built. From the tallest building in Beijing — Park Hyatt Beijing — to other projects — San Diego Hilton, the Charlotte Weston. Getting a good portfolio built, of work, was I think an attribute. So they can grow upon that. Quality of design is a big piece of that; and also, I think more on the holistic side is the understanding of hotels. Hotels are a very unique program and project; a lot of pieces have to fit together. An architect that understands that from the planning side, and also from the designing side, and how that is expressed as an iconic building, or more just a functioning building — a hotel as a machine. These convention hotels are massive hotels for guest rooms but also a big influx in movement of people coming in for the convention and leaving. The programmatic requirements for those are just as complicated as for a lifestyle, select service or lifestyle hotel where it’s smaller but catered to the guest experience. Understanding how all those pieces work was an attribute that was helpful. Q. How is your work in the design of hospitality projects a “unique personal relationship”? A. I often refer to Las Vegas as an “experimental laboratory” for the hospitality industry in response to the ever-changing need to rethink and redefine the large resort properties. This not only encompasses guest-room configurations and room-to-suite mix ratios, but also expands to guest amenities and public spaces. Day club-pool-DJ-based amenities are beefing up while expansive check-in front desks are slimming down in favor of a more personal kiosk or personal device experience. For the rooms, Vegas was one of the first markets to explore the open bathroom concepts and living space configurations; this still continues today and can be seen throughout MGM’s City Center properties and the newly opened SLS Las Vegas. In terms of floor plate and room mix, Vegas led early with increasing suite counts and utilizing suite only properties. The “hotel within a hotel” concept was also expanded on in Vegas. This started with the Four Seasons at Mandalay Bay and continues today with MGM’s Hotel 32 (Monte Carlo), SkyLofts (MGM Grand) and Sky Suites (Aria) along with the branded Nobu Hotel inside Caesars Palace. There are plans to develop this concept in other existing properties along the Strip. Q. How is hospitality design changing? A. The design trends that are currently being explored could be considered a reaction to the established typology: Services versus opulence and wellness versus indulgence. For service, we are seeing personal experiences catered to the guests’ needs; this can be in the form of technology advances with personal devices to in-room automation which can both add to the ease of the guests’ experience as well as helping the efficiency of the property. Rooms filled with opulent materials, surfaces and dÃ©cor are trending toward a cleaner and “smarter” room. Wellness is now being integrated into the guest experience, not only in food offerings, fitness and spa amenities, but also in the guest room. This ranges from water and air purification systems to therapy-designed lighting systems to aid in relaxation and stress reduction. With added room technology components, these new room types create a low-carbon/energy conservation experience that can be marketed to the travelers’ demands as well as reinforce a company’s commitment to sustainability. Q. What is unique about building for new trend or multifunction spaces; the urban living spaces in large commercial spaces? A. I think lifestyle is big. You’re finding the major hotel brands have started dabbling, so you’re starting to see gaming get into that, too. Lifestyle is more about catering to a niche within a market. So if it’s sort of a younger demographic that is keen on handhelds; that’s a different room type. It’s a different experience they’d be looking for than maybe an overseas gamer coming in. So I think you’re going to start seeing more variety of properties within a hotel or resort to sort of cater to different market groups. You’re seeing that now; look at Caesars. You’re seeing the hotel within a hotel. The hotel within a hotel was done really well in Vegas. It’s been done other places but Vegas adapted to it really well.